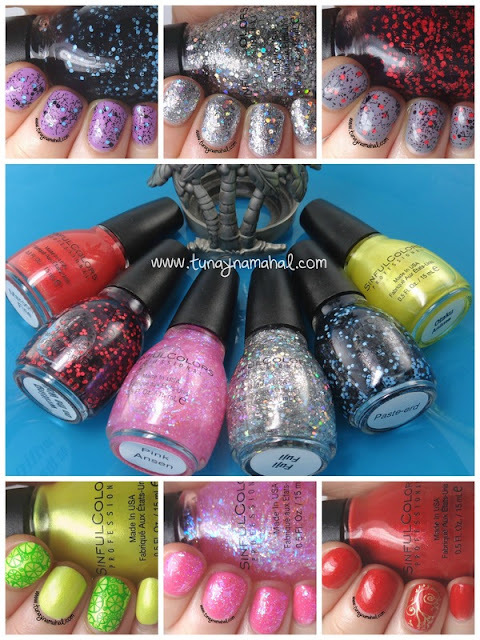 I was recently sent six of SinfulColors new summer shades for review. There's a mix of fun shimmers, and glitters, including 2 of the new Graffiti Bomb Glitters. *All swatches below use Seche Vite topcoat. 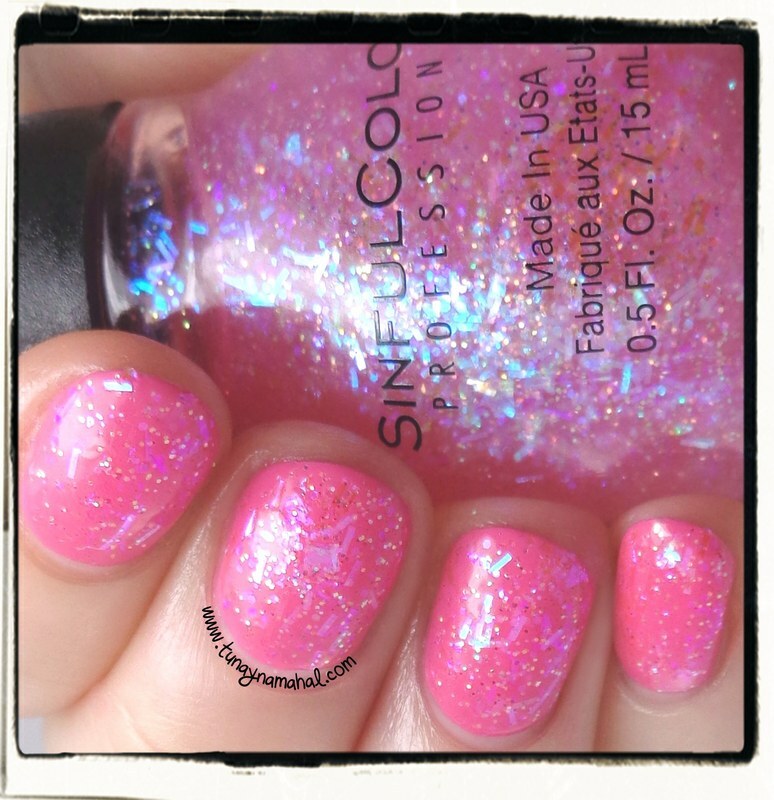 Pink Ansen: shimmery sheer pink jelly with iridescent flakies, glitter, and bar glitter. It's much too sheer to be built up opaque on it's own. It definitely needs to be layered over another color. I layered 2 coats of Pink Asen over Zoya Rooney. The base in the topper is a bit thick and goopy, so I wouldn't attempt more than two coats. And here it is with a matte topcoat, plus a palm tree stamp from Winstonia Store plate, W106. I definitely love Pink Ansen more when it's matte! (To get a smooth look, make sure you use the matte topcoat, after you've applied a regular topcoat). Fuji Fuji: Silver glitter with small holographic circle glitters. I used 2 coats of Rimmel Precious Metal, and 2 coats Fuji Fuji. This is like a disco ball in a bottle! 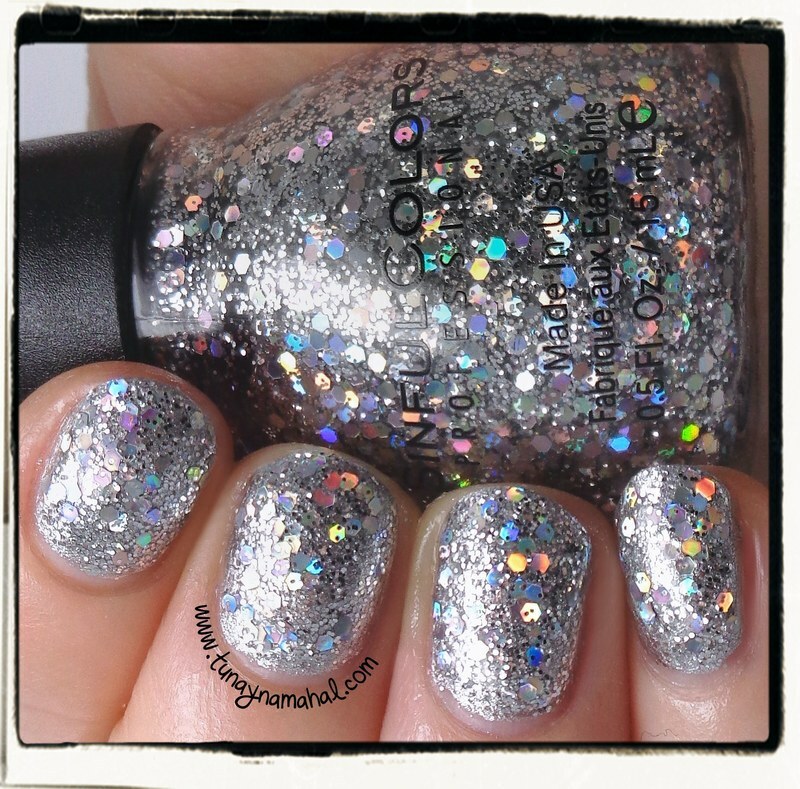 I love, love, love this one, such sparkly holographic goodness! Paste-erd: Light blue hex glitter, with black glitter, and black bar glitters in a clear base. I layered 2 coats over OPI Do you Lilac it? The blue hexes are not as dense as the rest of the glitter. You have to fish for them. I like the idea of these glitters and the final look. But I wish the blue hexes were denser. Writing on the wall: Red hex glitters, with black glitter, and black bar glitters. I would like this one more if the base was clear instead of tinted pink- (you can see this more on my ring finger where the base pooled). I'm not sure if the tinted base was intentional, or if the red glitters bled? The red hexes are not as dense as the rest of the glitter. You have to fish for them. I layered 2 coats over Rimmel Grey Matter. Otaku Anime: Very sheer shimmery bright lemon. Too sheer to really be opaque on it's own, so I layered 2 coats over OPI Alpine Snow. I stamped with Winstonia Store W118, and MDU Avocado. This shade of yellow doesn't really play nice with my skintone, but it's definitely a great summer color! Maroon Fine: Reddish Orange, with Orange Shimmer. Beautiful color! This is two coats. I stamped with a Born Pretty Store plate QA76, and Maybelline Bold Gold. Which SinfulColors is your favorite? $1.99 each, nail polish and appliques, at Walgreens and other mass retailers.